Adrian Peel från Suite101.com intervjuade Bruce Kulick angående hans tid i Kiss. Vinnie Vincent left amid controversy in 1984, with the lead guitar spot then being occupied for a very short time by the late Mark St. John, who, due to health reasons, was subsequently replaced by Brooklyn-native, Bruce Kulick – all within the same year. Kulick would remain with the group until Simmons and Stanley reunited with Frehley and Criss 12 years later. Had you always been a fan? What are your fondest memories of your time with Kiss? Which were your favourite songs/albums/videos on which you played? Any amusing stories from the road? How do you think the unmasked period will be remembered in years to come? What are your all-time favourite Kiss songs, albums and videos? As the two ever-present members from Kiss’s inception to the present day, Gene Simmons and Paul Stanley have been the constant driving force behind the band, as well as its undisputed leaders. What was Bruce’s relationship with them like and was he allowed creative freedom within the group? What are your recollections of the late Eric Carr (Carr died of heart cancer in 1991 – his place behind the drums being taken by Eric Singer)? In 1996, the four original members of Kiss reunited at the 38th Grammy Awards. They were brought out, dressed in full 1970s get-up, by rapper, 2Pac, to present the award for best pop performance by a duo or group, which, incidentally, went to Hootie & the Blowfish for Let Her Cry. How did you first hear that Gene and Paul were getting back with Ace and Peter? The highly-lucrative reunion tour lasted until 2001, when Peter Criss, apparently unhappy with his salary, left the band. He returned in 2002 and then left again for good in 2004. His replacement on both occasions was his predeccesor in the early ’90s incarnation of Kiss, Eric Singer, who continues to wear Criss’s ”Catman” make-up on stage. Ace Frehley quit the group in 2002, believing that their 2000/2001 Farewell Tour would be their last. 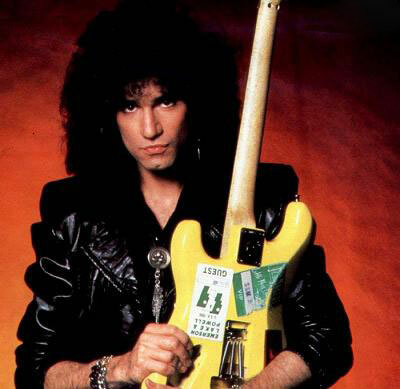 Although Criss had been replaced by Singer, Bruce Kulick was not called upon to take Ace’s place. That honour went instead to Tommy Thayer, who has been inhabiting Ace’s ”Spaceman” character since 2002. There has been a lot of controversy, particularly among members of the Kiss Army, over Thayer and Singer dressing like Frehley and Criss. Does Bruce think it’s right, or should they come up with new designs? To this day, despite the success of the unmasked era, Kiss are still best-known for their ”alter-egos” – their alternative personas, reflected in extravagant outfits and face-paint – designed to fully encapsulate the members’ individual personalities. Was Bruce ever asked to come up with his own idea for a character, just in case the group decided to go back to wearing make-up?